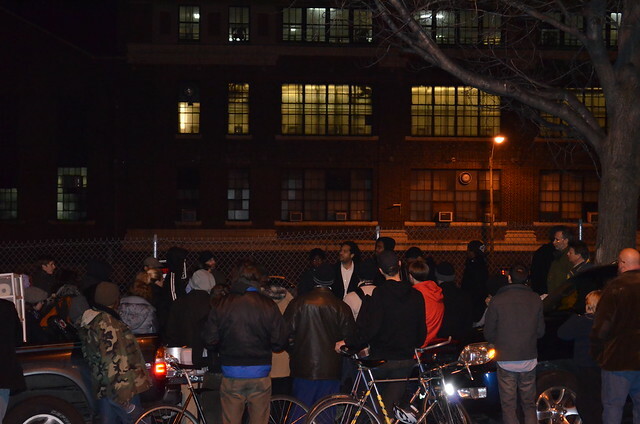 Wednesday, Jan.18th, 2012, marked the third day of the five-day "pop-up" occupation: Schools Not Jails. This demonstration strives to bring awareness and to protest the city's proposed youth jail. 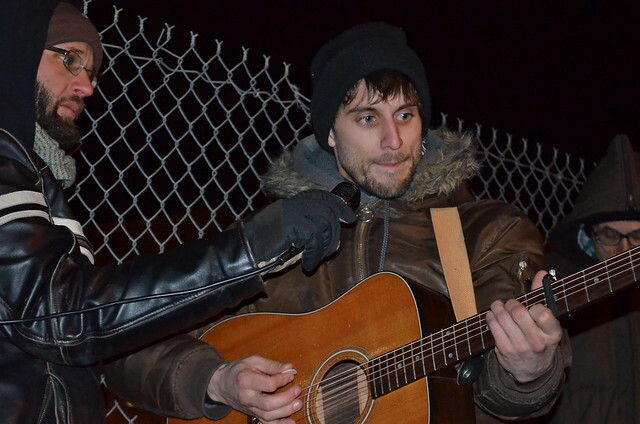 While the organizers' original gameplan had been to occupy the site of the proposed youth jail 'round the clock, from Monday-Saturday, by Wednesday the strategy had dramatically shifted. Monday's kick-off demonstration had been met with extreme police force, including: arrests, an incredibly imposing presence of riot police, and the destruction of both the occupation's encampment and the activist-constructed symbolic "school house". 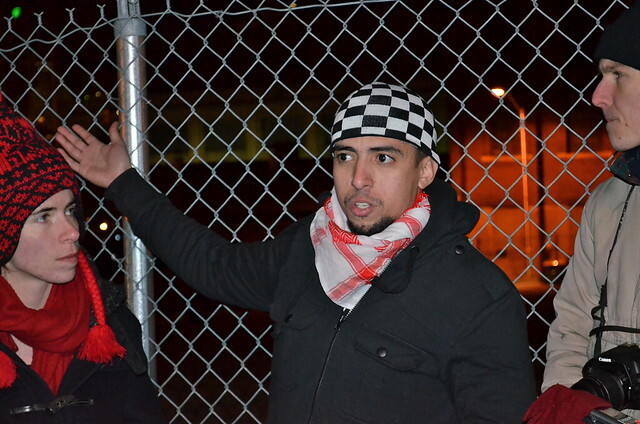 On Tuesday morning, four activists had arrived at the site of the proposed youth jail. They planned to serve breakfast to arriving demonstrators and to set-up some small structures, like tarps, in order to have shields against the winter rain. Awaiting police officers had quickly approached the activists. They told the activists that they couldn't be at the site during the day. Strongly outnumbered by the officers, the demonstrators left the site. Yet, they left only after clarifying with the police, that the occupation did have events scheduled in the evenings, and that the demonstrators would be returning to the site every night. The police gave their assurances that this would be allowed. The activists regrouped. Utilizing the movement's resources and energies, they decided to occupy the site during the evenings, while planning mass weekend events. At 6pm that Tuesday night, occupiers reconvened for dinner; followed by the 6:30 discussion: Reflections on the Radical Legacy of Martin Luther King, Jr. and connections to nonviolent struggles being waged today, with Dr. Robert Birt. Ending the evening with a talk by local radical think-tank, Leaders of a Beautiful Struggle, on the : Youth and the Prison Industrial Complex. While there was enormous police presence at the evening's presentations, the Schools Not Jails occupation held the ground for hours at duration. All steps towards a sample of their goals: reclaiming space and critical education. Wednesday, January 18th, marked mid-occupation. Following their newly constructed plans, activists began arriving to the site around 6 pm. Free pizza had been donated by Two Boots and someone had made a feast of beans and rice. Dinner was being served on car rooftops. Despite the incredibly bitter cold, organizers trickled in for the night's events (again greatly outnumbered by the police presence - who took a hands-off approach to the protesting crowd). Civilian-Soldier Alliance, "...an organization of civilians working with veterans and active-duty service-members to build a GI resistance movement towards a just foreign policy," - led a short teach-in on the cross-realities between the military industrial complex and the prison industrial complex. 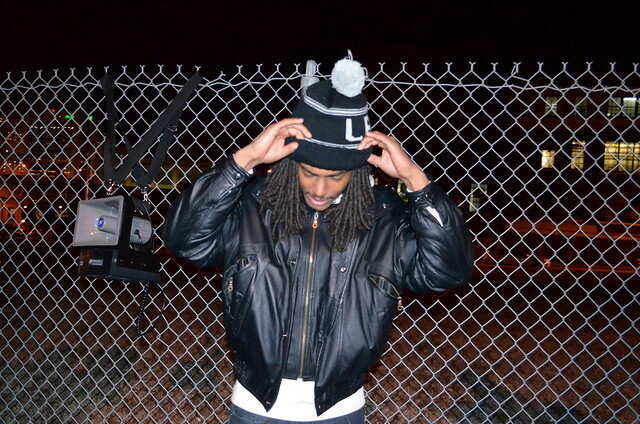 Also, listen/watch an Indyreader exclusive interview with the present members of Civ-Sol. 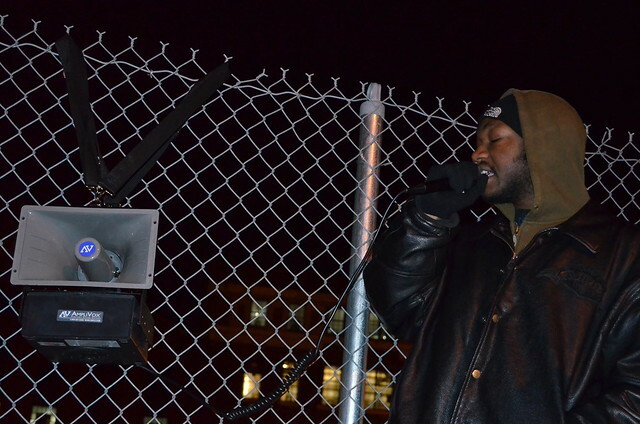 The evening ended with a concert by local political artists: Emmanuel Jackson, Ryan Harvey, and Comrade. You can listen to that concert exclusively here. At the end of the evening, one activist announced a just-planned action, taking place this Friday at War Memorial Plaza. On Friday, January 20, to celebrate a successful week of action, we will converge at War Memorial Plaza (in front of City Hall) at 4PM for Baltimore’s first Public Recreation Day! Bring footballs, art supplies, hula hoops, jump ropes, books and other creative activities; let’s turn War Memorial Plaza – which is public property – into a recreation center for the afternoon, and welcome the citizens of Baltimore for an hour (or two) of good, high-energy, fun as we demonstrate what the alternatives to a youth detention center could look like. The concert ended. The freezing crowd went home for the night. But they came out again the next night to discuss Prison Abolition. They've planned actions for Friday. And there's a march to the Mayor's Participatory Budget Hearing on Saturday, at 10 am. Mid-week and the night's concert and teach--in has ended. Yet, the movement has just begun.